So as to seal in the paint and protect your art piece from dust, you can put several coats of acrylic varnish on it with a sponge or paint brush. These display images are not the actual oil paintings you will receive. 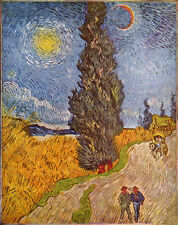 Vincent Van Gogh 1889 "Bedroom At Arles" 1997 Poster Modern Art Print by 24"x32"
Title - Bedroom At Arles 1889. Artist - Vincent van Gogh. This is a 1997 U.S.A. print that is in very good to excellent condition. Vincent van Gogh "A Pair of Shoes", 1887. Printing at high resolution, prints on100% natural linen canvas. Canvas size (image size) 42 cm x 29.7 cm (16.5"X11.7")without borders. (Not cotton!). Just write us what you have chosen and we will add it to your parcel. Vincent Van Gogh "Still life with hazel in a copper vase". Printing at high resolution, prints on100% natural linen canvas. Canvas size (image size) 42 cm x 29.7 cm. (16,5"X11.7") without borders. Vincent van Gogh "Still Life with Two Sunflowers", 1887. Printing at high resolution, prints on 100% natural linen canvas. Canvas size (image size) 42 cm x 29.7 cm. (16,5"X11.7"). (Not cotton!). Just write us what you have chosen and we will add it to your parcel. Vincent van Gogh" Vase with Twelve Sunflowers ", 1889. Printing at high resolution, prints on 100% natural linen canvas. Canvas size (image size) 21 cm x 29.7 cm (8.3"X11.7"). (Not cotton!). Vincent van Gogh " Still Life with Two Sunflowers", 1887. Printing at high resolution, prints on100% natural linen canvas. Canvas size (image size) 21 cm x 29.7 cm (8.3"X11.7") without borders. (Not cotton!). Vincent van Gogh " Still Life - Vase with Fifteen Sunflowers ", 1888. Printing at high resolution, prints on 100% natural linen canvas. Canvas size 21 cm x 29.7 cm (8.3"X11.7"). The image size corresponds to the size of the canvas. There are many online videos showing how to do each step of this process. These display images are not the actual oil paintings you will receive. Do you like another painting or photograph better than the ones listed?. Vincent Van Gogh Bedroom In Arles Painting. Made in Amsterdam by the Van Gogh Museum. High resolution reproduction linen canvas on wooden stretcher. Item no. : # 53338. Vincent Van Gogh - Still Life, A Pair Of Shoes, 1886. 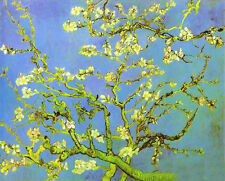 Artist: Vincent Van Gogh. 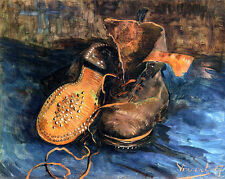 Title: Still Life, A Pair Of Shoes, 1886. Rest of the world Style: Art/Photography/Impressionism. FINE ART REPRODUCTION PAPER SUITABLE FOR FRAMING. WE WILL TRY OUR BEST TO SOLVE THE ISSUE. PAPER SIZE 11" X 14". IMAGE SIZE 10" X 8". Reproduced in this photo print is an Impressionistic painting entitled "Vase of Roses.". 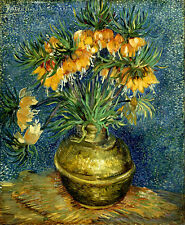 The still life with its iconic style vase is by Dutch artist Vincent Van Gogh. Vase of Roses 8.5" x 11" Photo Print, Art by Vincent Van Gogh. Luncheon With Wine Glasses Still Life 8.5" x 11" Photo Print, Art by John F. Francis. This table scene is by artist John F. Francis. A: Products are new, albeit, reproductions, unless otherwise stated.